Geographical variation: New Zealand birds belong to the largest (and dark-backed) subspecies baueri. 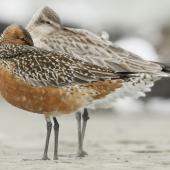 There are four other recognised populations, two within East Asian Australasian flyway: the pale-backed menzbieri breeding in north central Siberia and the smaller anadyrensis breeding in the Russian Far East. 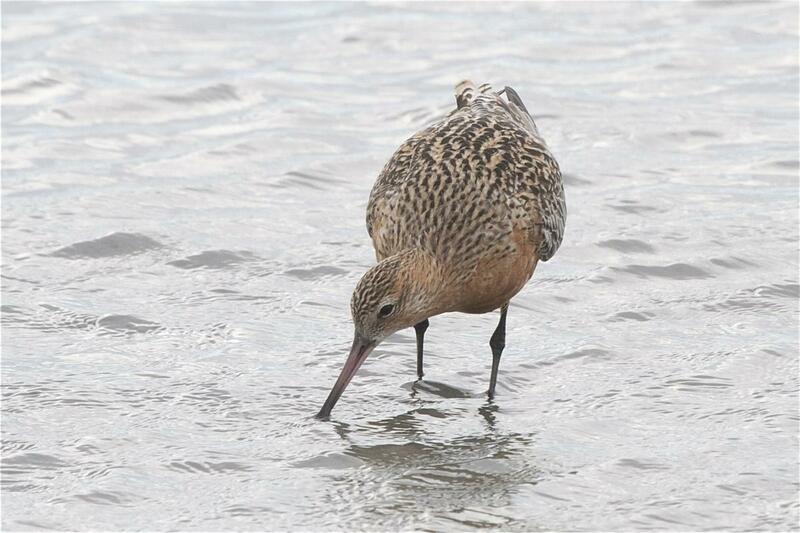 Birds from both populations have been reported from New Zealand, but records have not been assessed by the Birds New Zealand Records Appraisal Committee. 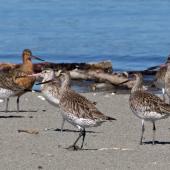 Their brown and grey plumage echoes the intertidal mudflats where they forage, and for much of their time in New Zealand they are relatively nondescript birds. 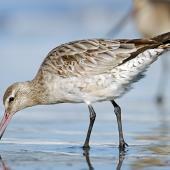 But there is nothing nondescript about the migrations of bar-tailed godwits. 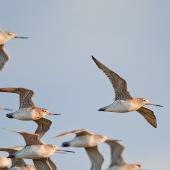 They perform the longest nonstop flights of any non-seabird, and, unlike a seabird, there is no chance of an inflight snack. 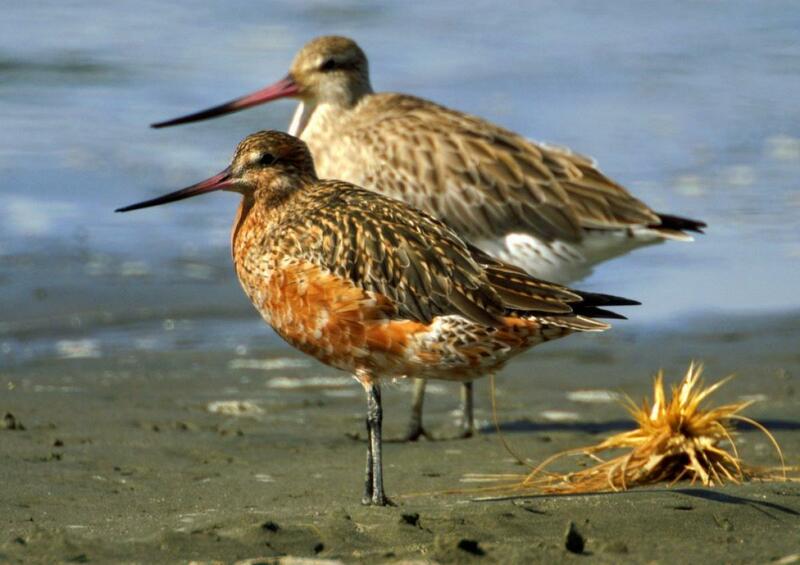 Godwits hold cultural significance for many New Zealanders. For Maori they were birds of mystery, (‘Kua kite te kohanga kuaka? Who has seen the nest of the kuaka?’) and were believed to accompany spirits of the departed; but they were also a source of food. 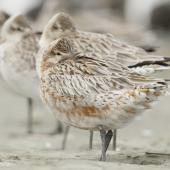 They are the most numerous tundra-breeding shorebird species to occur in New Zealand, with around 75,000 here each year. 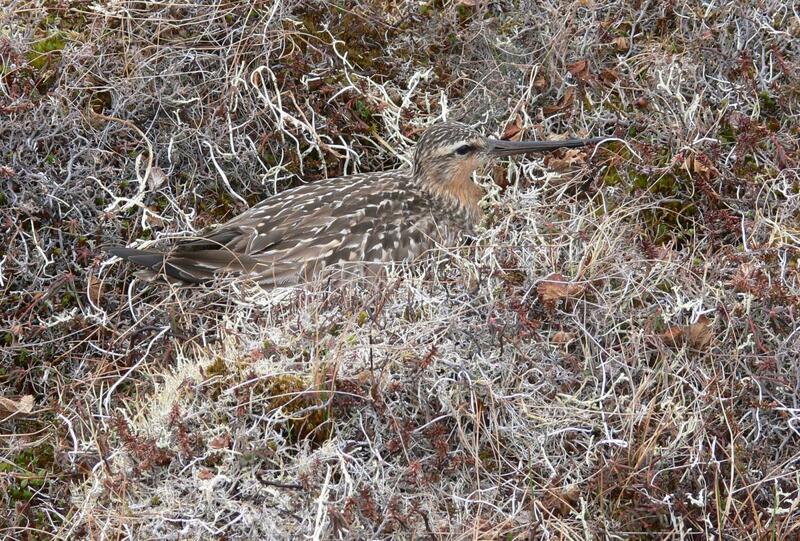 Virtually all New Zealand birds are from the baueri subspecies breeding in western Alaska. 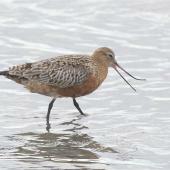 They are relatively common at many harbours and estuaries around the country. 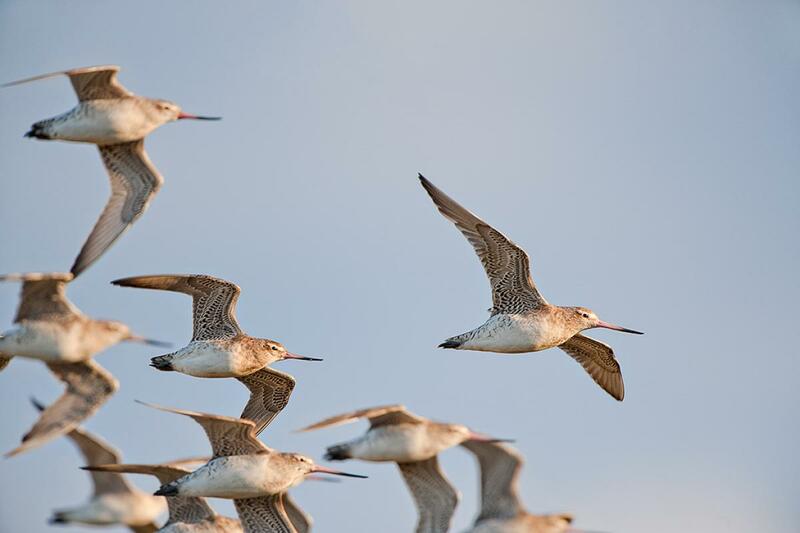 Following the breeding season, birds generally begin arriving from early September, usually after a non-stop 8-9 days flight. 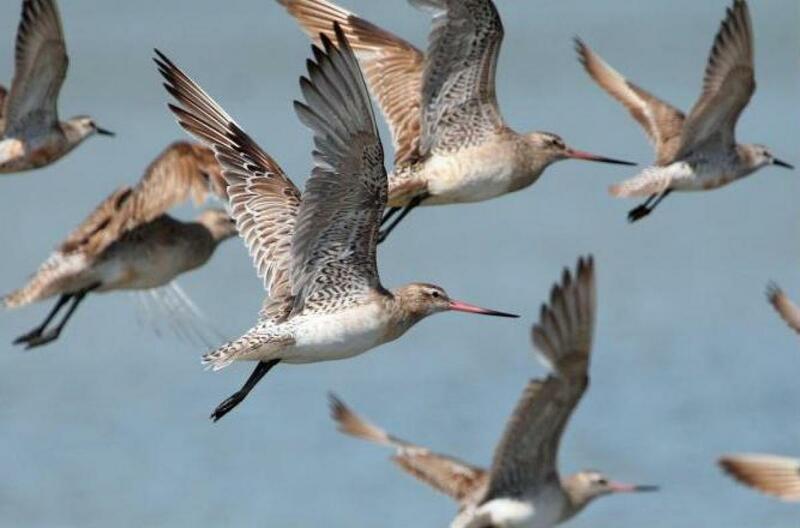 They begin departing on northern migration from early March, heading for refuelling sites around the Yellow Sea. 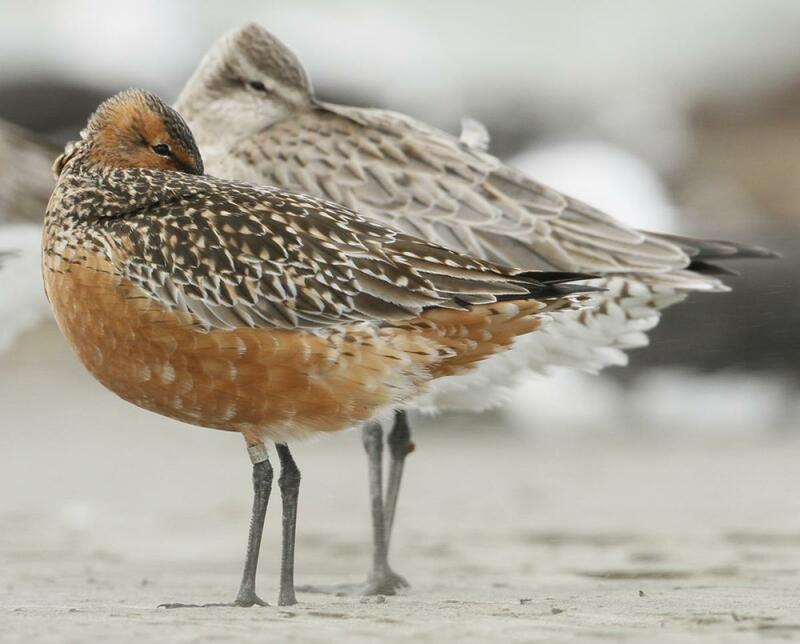 They do not breed until their third or fourth year, so each southern winter there are hundreds of non-breeding birds remaining in New Zealand. 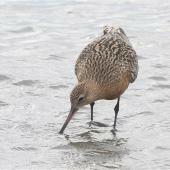 The bar-tailed godwit is the most common Arctic migrant in New Zealand. 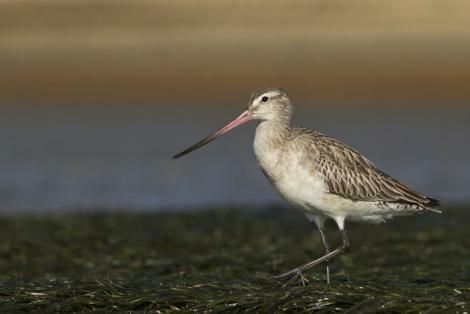 It is a large long-legged wader, predominantly brown above, pale below, with a long tapering and slightly upturned bi-coloured bill, pink at the base and black towards the tip. 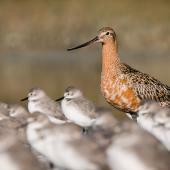 Males are markedly smaller with shorter bills than females. 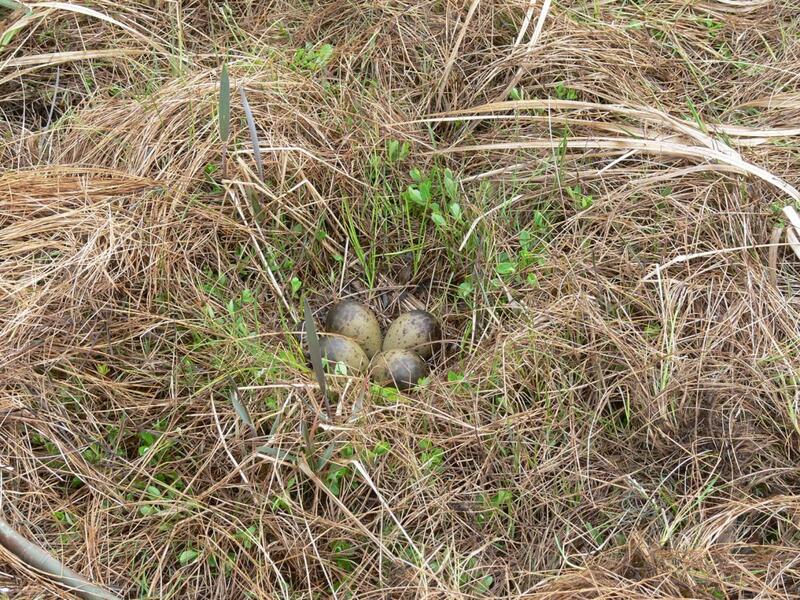 While some overlap in size and bill-length does occur, most of the time sexes can be separated in the field. 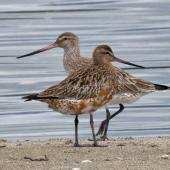 In non-breeding plumage both sexes alike: crown and hind neck pale brown with dark streaks; scapulars and coverts brown with dark centres and pale fringes giving streaked appearance; lower back, rump and tail barred with brown. 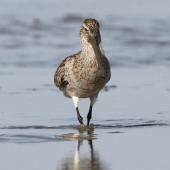 Underparts pale with grey-brown wash and fine streaking on neck and flanks. 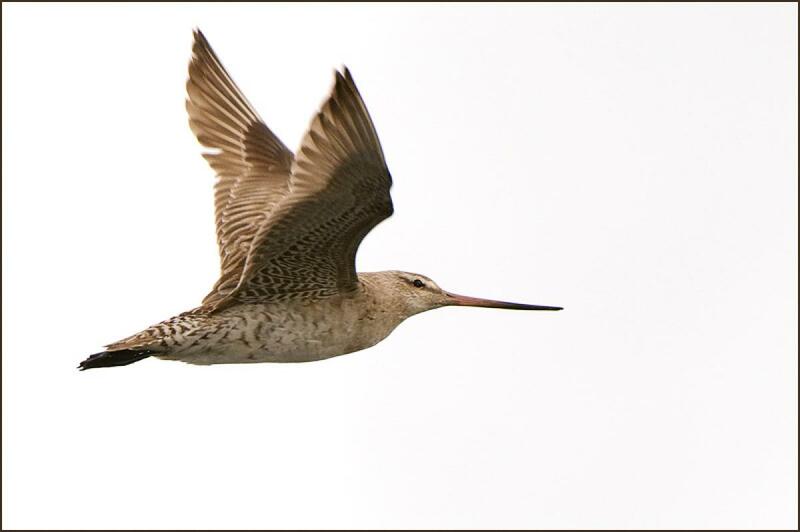 In flight uniform colour and pattern, wing stripe often indistinct; feet partly project beyond tail. 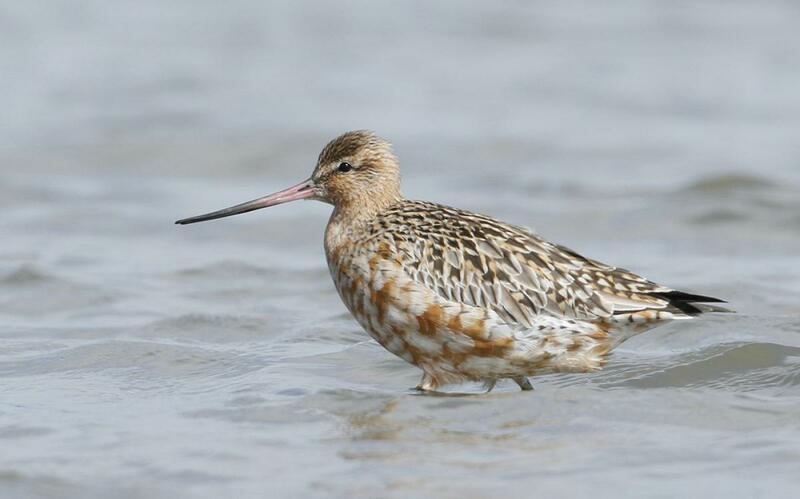 In breeding plumage most males undergo a complete transformation, becoming bright rufous on the head, neck, breast and belly, with strongly contrasting upperparts – dark feathers with buff fringes and notches. 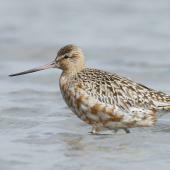 Females are considerably less colourful, becoming strongly streaked and barred on neck, breast and flanks, sometimes with pale rufous wash. 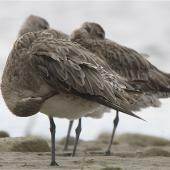 Juveniles that have recently arrived in New Zealand are recognisable by the broader buff margins to their scapular and back feathers, making them appear more mottled than adults; this plumage is rapidly moulted and replaced. 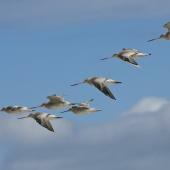 Voice: godwits most commonly call in flight, usually a-wik,a-wik,a-wik. 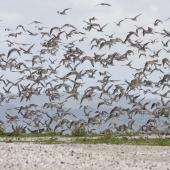 For most of their time in New Zealand they are usually silent on the ground, but immediately before migration departures there is a notable increase in both frequency and volume of calls from individuals that are about to leave. 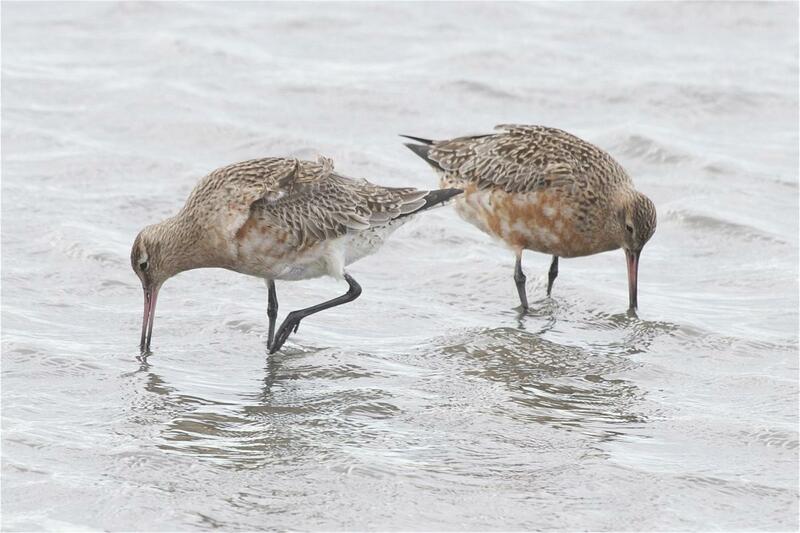 Similar species: black-tailed godwit and Hudsonian godwit are both smoother grey-brown on the back, have prominent white-and-black wingbars, and a white rump contrasting with their black tail. 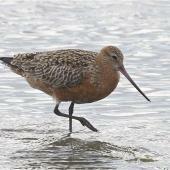 The bill is slightly upturned in Hudsonian godwit, but is straight in black-tailed godwit. 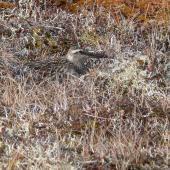 Whimbrels are slightly darker, with striped heads and down-curved bills. 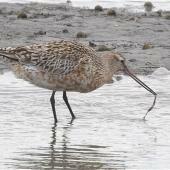 Eastern bar-tailed godwits breed in western Alaska and migrate to New Zealand and eastern Australia. 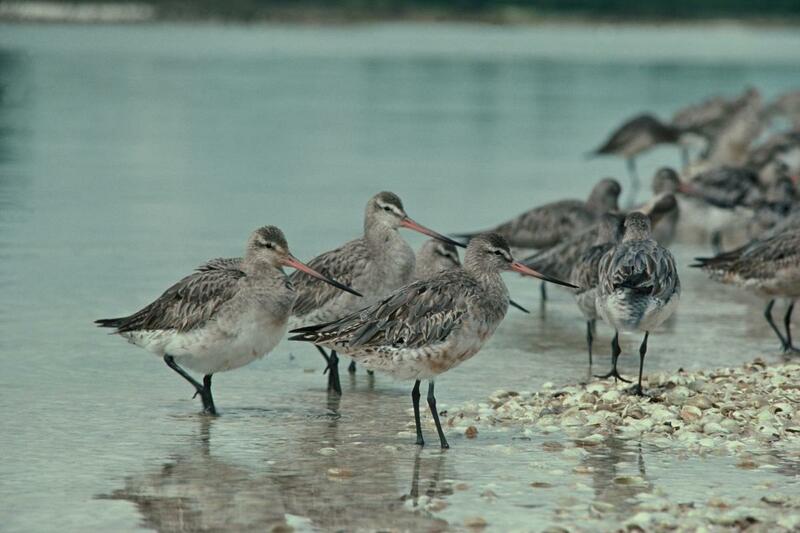 They are widely distributed around the country and some birds may occur on almost any harbour or estuary, although the bulk of the population occur at larger sites: Parengarenga, Kaipara, Manukau, Firth of Thames, and Farewell Spit. 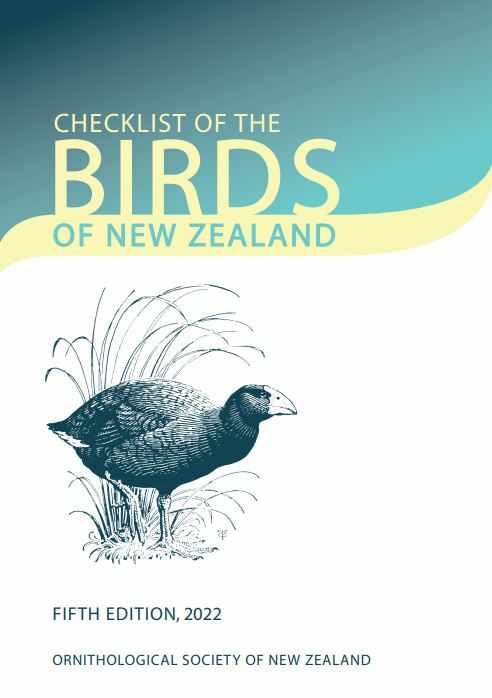 Other good sites include Rangaunu, Whangarei, Tauranga, Ohiwa, Kawhia, Porongahau, Foxton Beach, Tasman and Golden Bays, Avon-Heathcote, Blueskin Bay, and Invercargill Estuary/Awarua Bay. 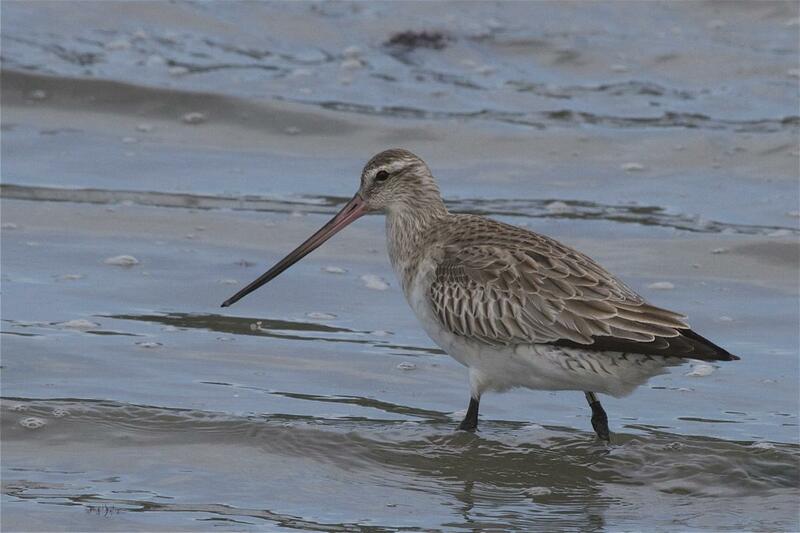 Bar-tailed godwits predominantly forage on soft intertidal substrates but may also be found probing in wet pasture. 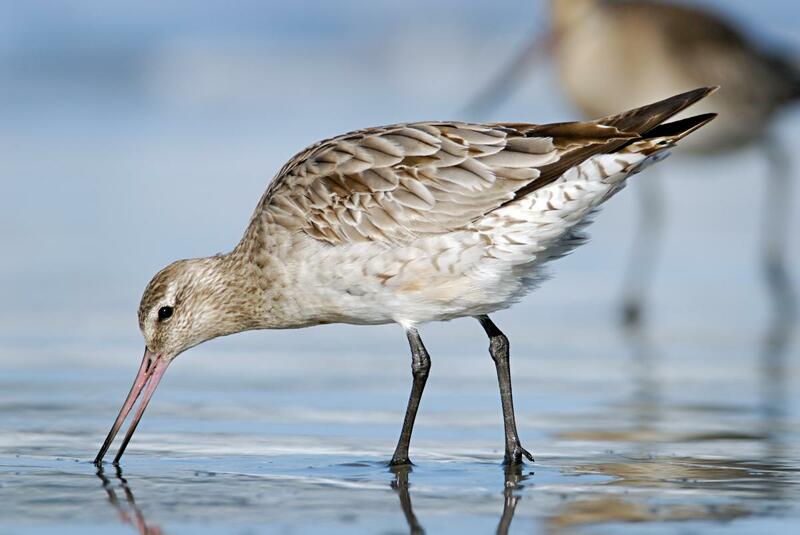 The population of subspecies baueri (eastern bar-tailed godwit ) is likely less than 150,000 birds, 75,000 of which occur in New Zealand. 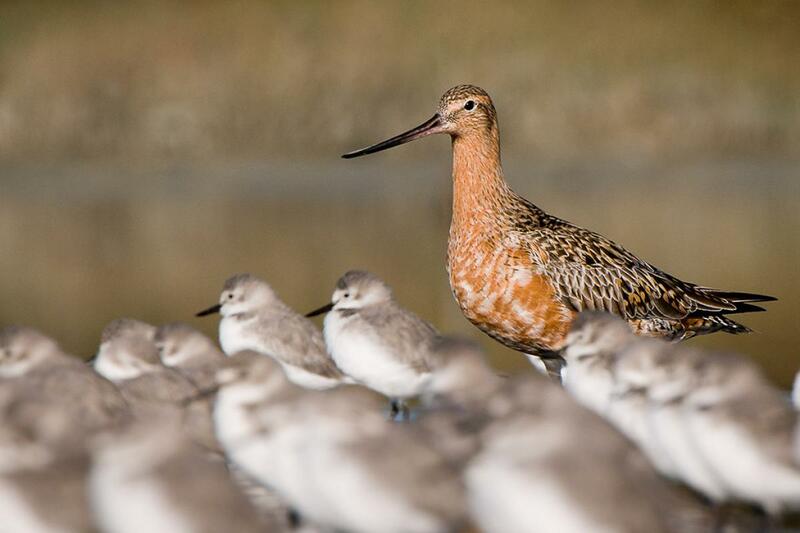 Bar-tailed godwits are fully protected in New Zealand. 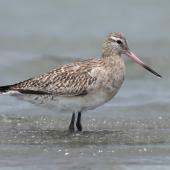 Current count data indicates an annual population decline of nearly 2%, the primary driver of which is extensive habitat loss at staging areas in the Yellow Sea region. 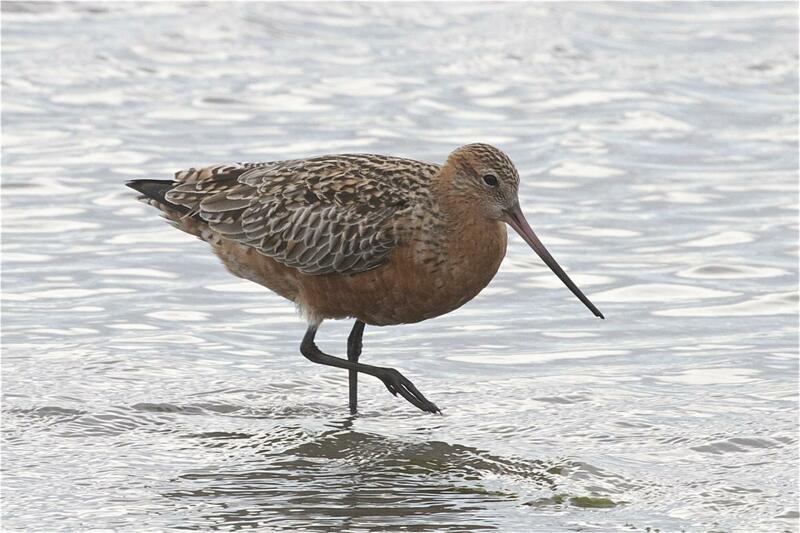 Godwits tend to be wary and easily spooked, and so preventing or minimising disturbance at high tide roost sites is an important conservation consideration. 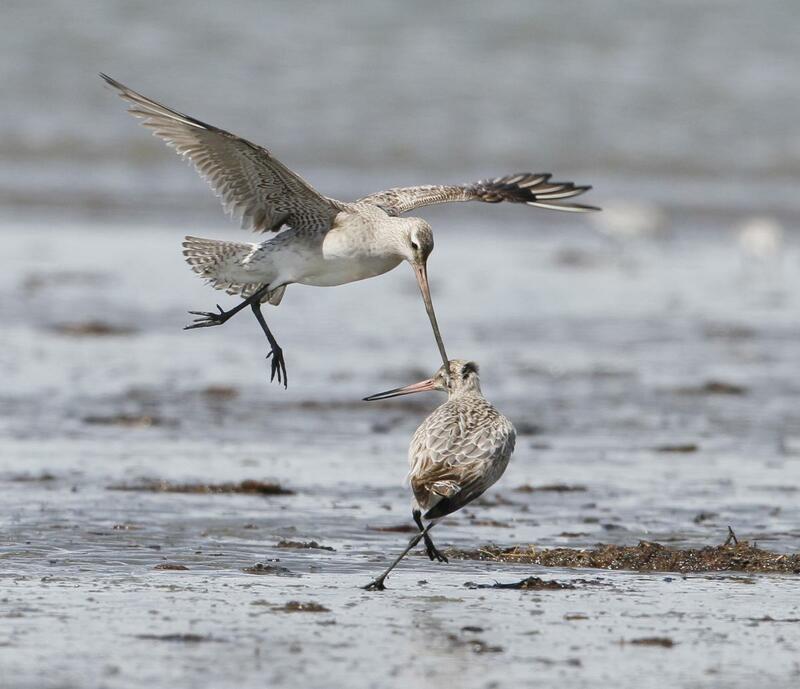 As with other migratory species using the East Asian Australasian Flyway, bar-tailed godwits face a real and potent threat from habitat loss, particularly at critical migration stopover sites in the Yellow Sea region. 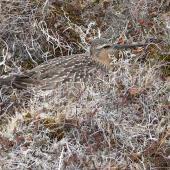 They are subjected to subsistence harvest by indigenous people in Alaska, but the number of birds taken is probably minimal. 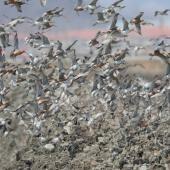 Predicted Global Climate Change is likely to affect birds at all stages of their annual cycle. 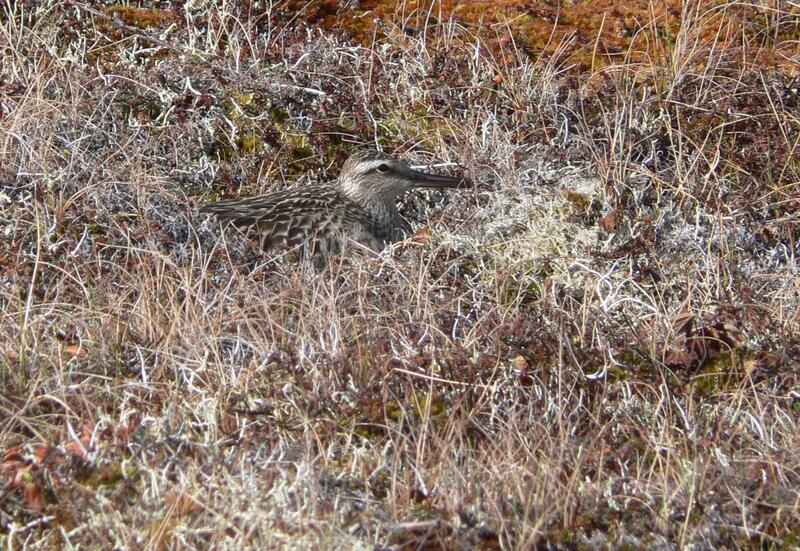 Expansion of shrubs and trees into tundra regions is likely to reduce suitable breeding habitat. 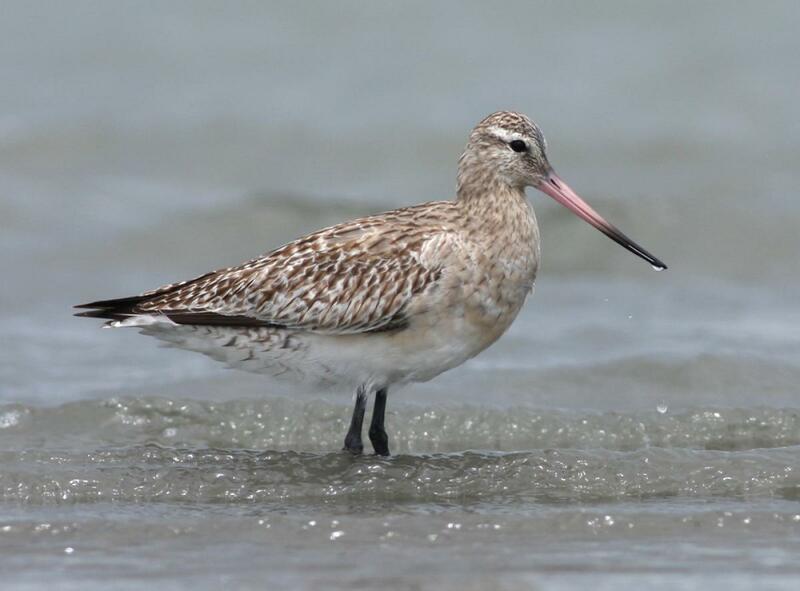 Earlier peak invertebrate emergence in response to temperature changes may lead to major disruption of breeding strategy: that is, peak food supply may have occurred before hatching. 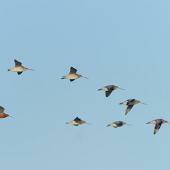 Utilising suitable wind patterns is a key component of godwit migration strategies, so changes to synoptic weather patterns on migration routes is likely to pose major problems for these birds. 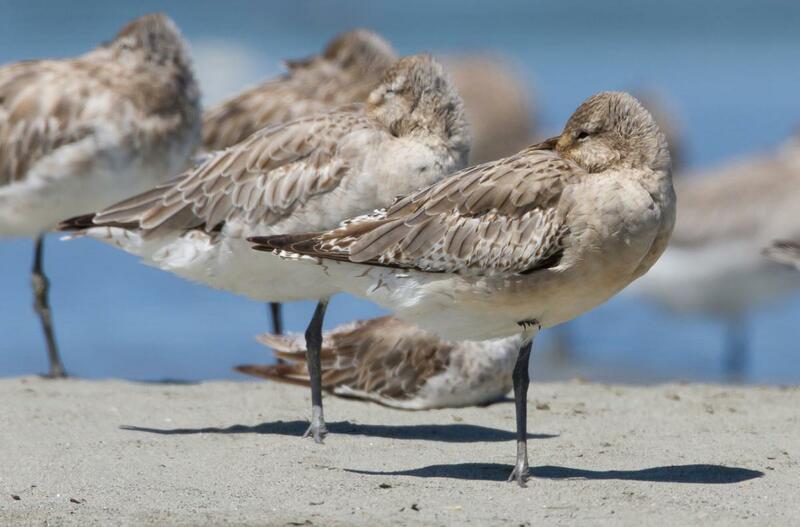 Rising sea levels will greatly reduce intertidal foraging habitat at wintering, staging and post-breeding sites. 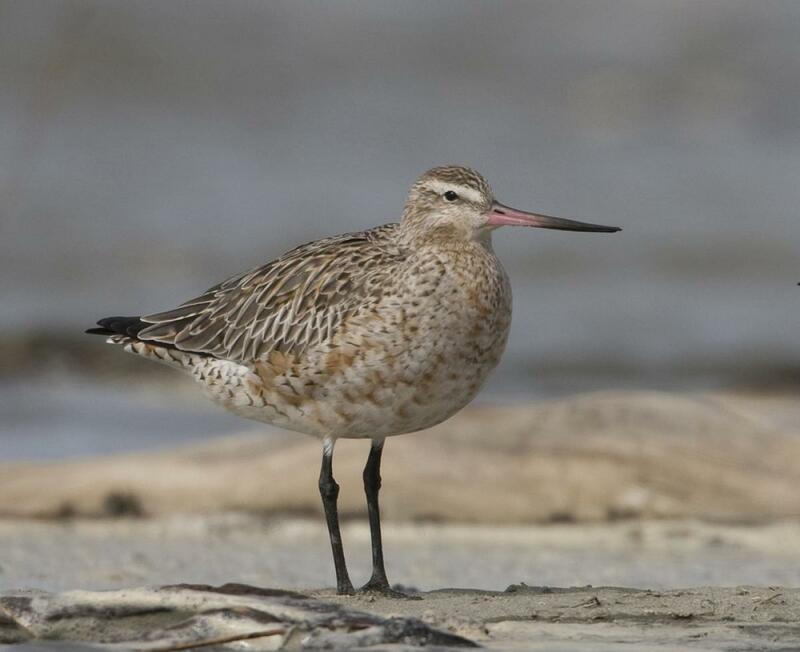 The conservation status of this species was changed to At Risk, Declining in 2016. 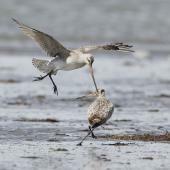 Eastern bar-tailed godwits breed on upland and coastal tundra on the western rim of Alaska, from the coast to up to 200 km inland, from the Gulf of Alaska to North Slope. 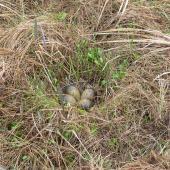 A clutch of four eggs is laid in a shallow bowl often lined with lichen. 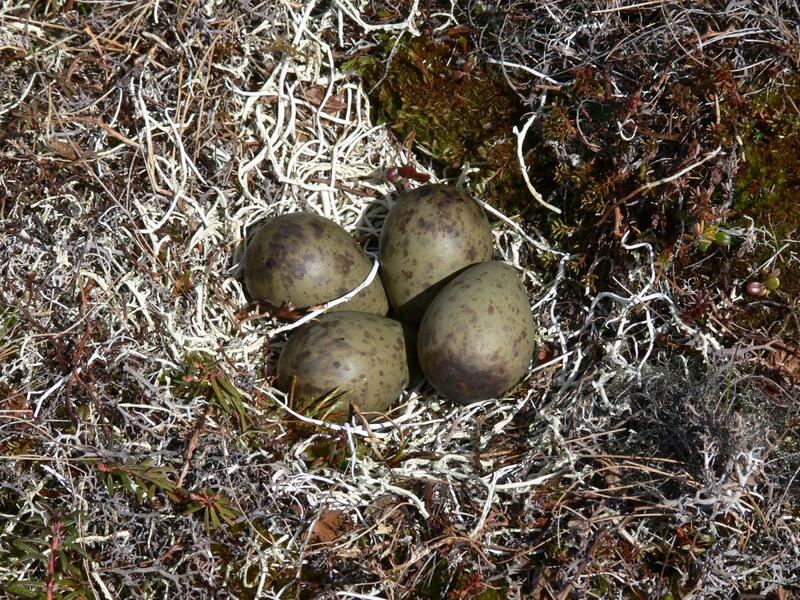 Each egg is approximately 11% of a female’s body mass. 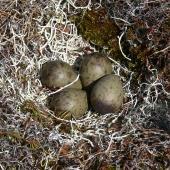 The pay-off for these huge eggs is fully developed and mobile chicks at hatching. 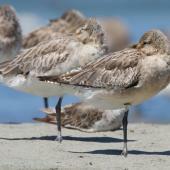 Parents share incubation and brooding post-hatching, but one parent may depart for the migration staging area earlier. 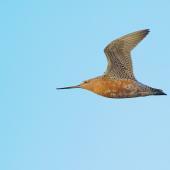 Young fledge after 28-30 days. 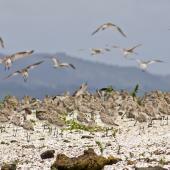 Juveniles arrive in New Zealand after their first trans-Pacific flight when barely four months old. 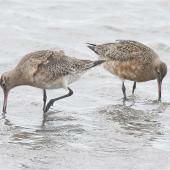 Bar-tailed godwits forage over the intertidal zone at low tide – either individually dispersed or in loose formations. 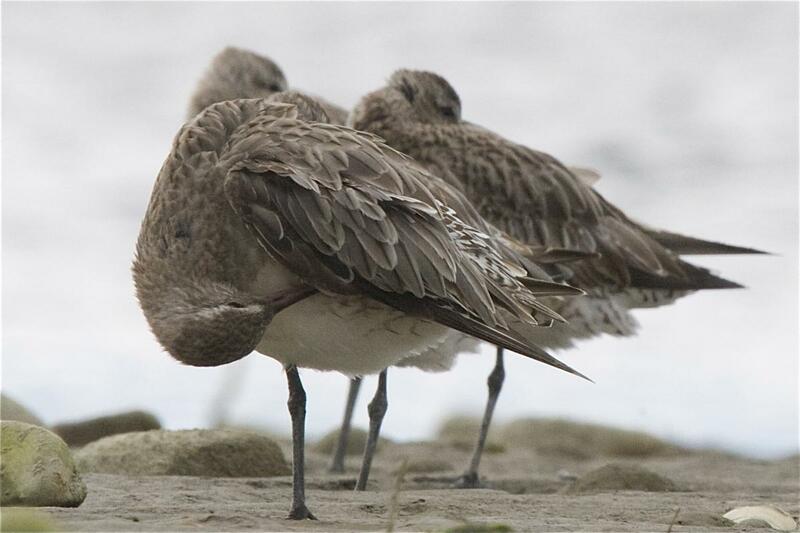 They congregate in flocks at high tide roosts, but can be extremely wary birds, often difficult to closely approach at New Zealand sites. 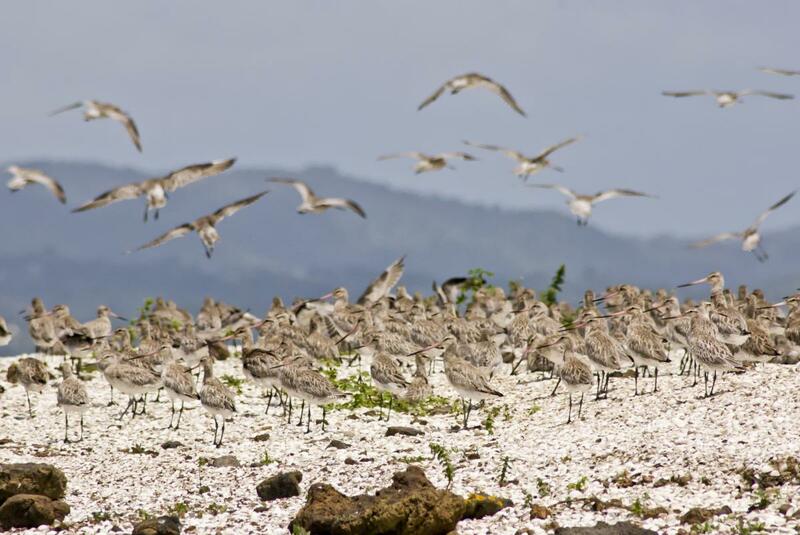 In parts of Auckland, flocks are commonly seen commuting between the Manukau and Waitemata Harbours. 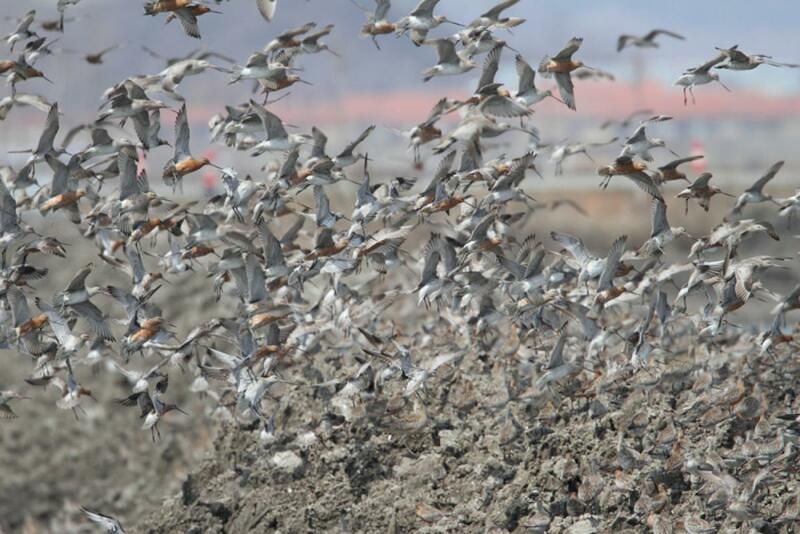 Migration departures are staggered through March, in flocks varying between less than ten birds to over a hundred. 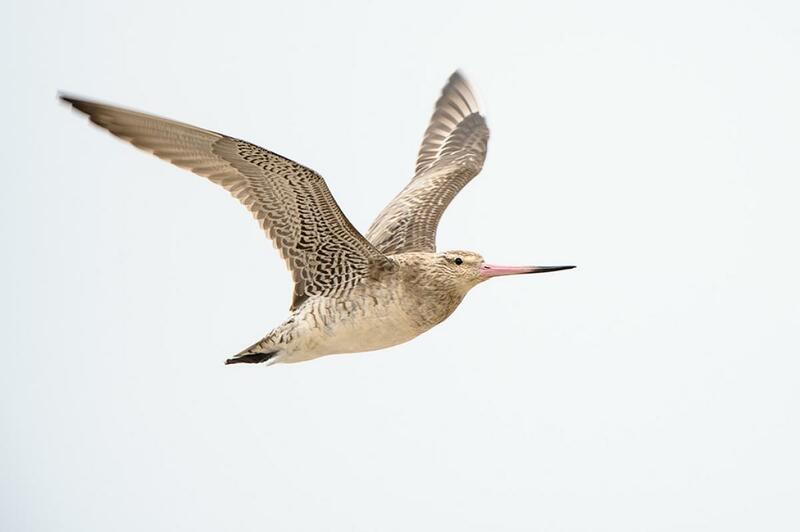 Individual birds have their own departure schedule and will aim to leave within the same 3-4 day window each year. 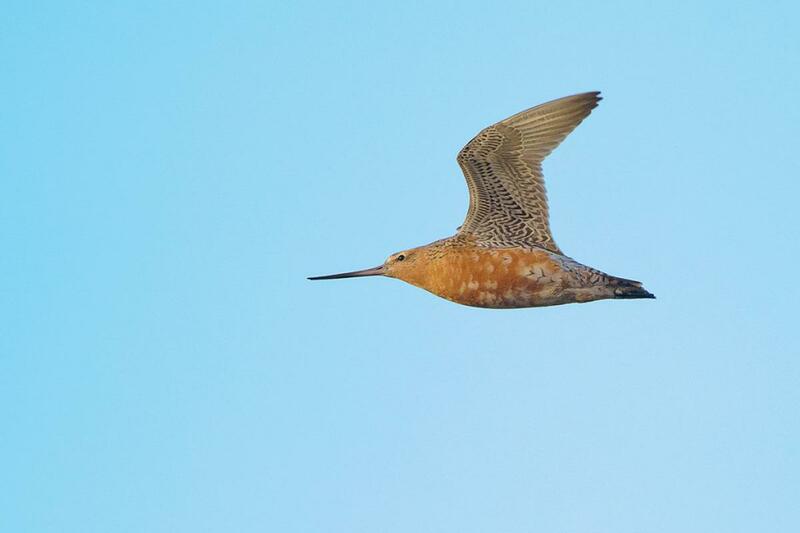 Time of departure from New Zealand is determined by a bird’s destination: birds leaving in early March breed in more southern areas of western Alaska while birds leaving in late March breed north of the Brooks Range. Snow cover which clears in southern areas from early May but not until the beginning of June in the north explains these staggered departures. 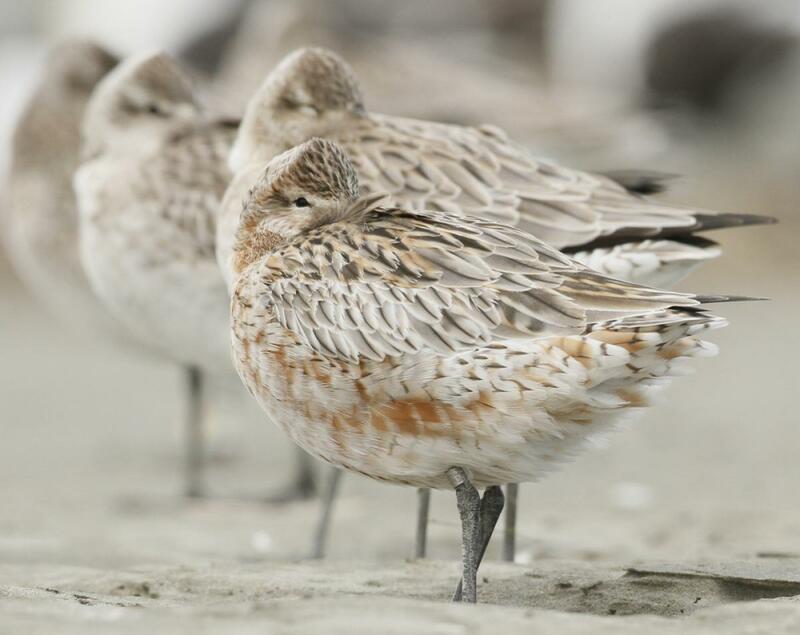 Post-breeding adults and juvenile birds congregate along the southern coast of the Alaskan Yukon-Kuskokwim Delta preparing for southward migration. 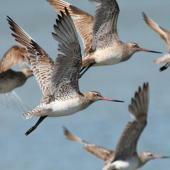 Birds tracked by satellite on their 11,000-12,000 km flights to New Zealand took 8-9 days, with an average flight speed of 56 kph. 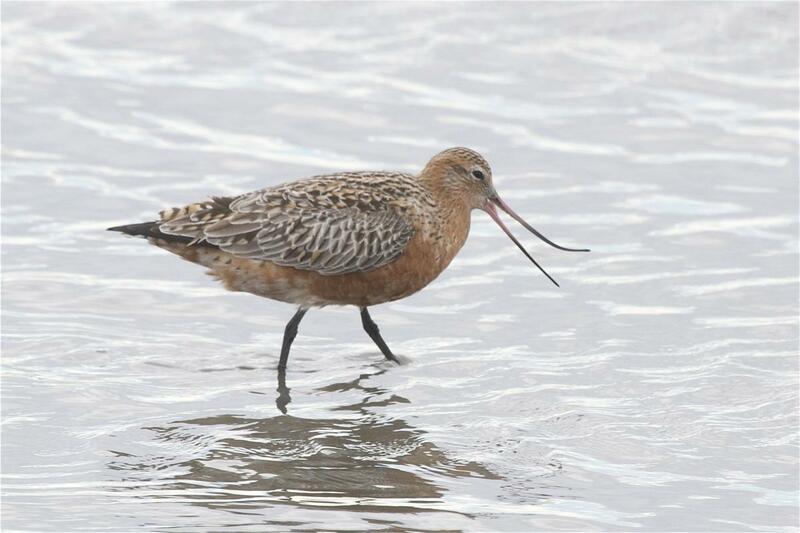 On non-breeding grounds bar-tailed godwits mainly eat polychaetes (probably over 70% of diet) but also small bivalves and crustaceans. They also forage in wet pasture for terrestrial invertebrates. 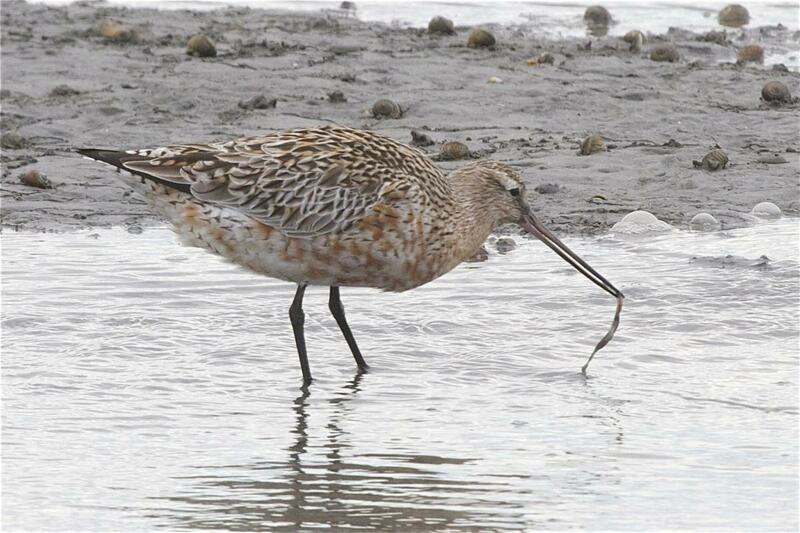 On breeding grounds, they consume cranefly larvae and other invertebrates, and some berries, particularly soon after arrival. Battley, P.F. ; Warnock, N.; Tibbitts, T.L. ; Gill, R.E. Jr.; Piersma, T.; Hassell, C.J. ; Douglas, D.C.; Mulcahy, D.M. ; Gartrell, B.D. ; Schuckard, R.; Melville, D.S. ; Riegen, A.C. 2012. 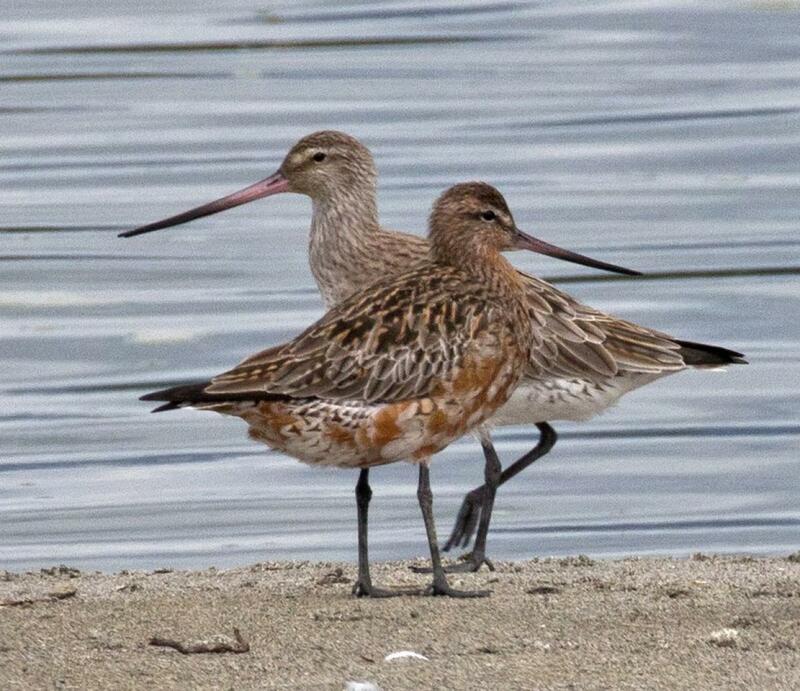 Trans‐hemispheric migration timing, flight paths and staging in two bar‐tailed godwit subspecies. 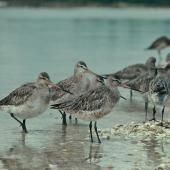 Journal of Avian Biology 43: 1-12. Conklin, J.R.; Battley, P.F. 2011. 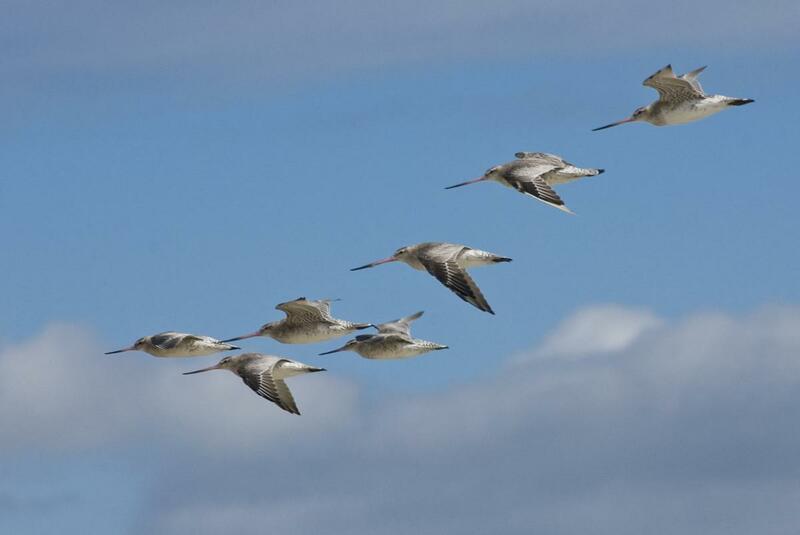 Impacts of wind upon rigid individual migration schedules of New Zealand bar-tailed godwits. Behavioural Ecology 22: 854-861. Conklin J.R; Battley, P.F. : Potter, M.A. : Fox, J.W. 2010. Breeding latitude drives individual schedules in a trans-hemispheric migrant bird. Nature Communications 1: Article 67, online (2010) doi:10.1038/ncomms1072. Gill, R.E. Jr,; Piersma, T.; Hufford, G.; Servranckx, R.; Riegen, A. 2005. 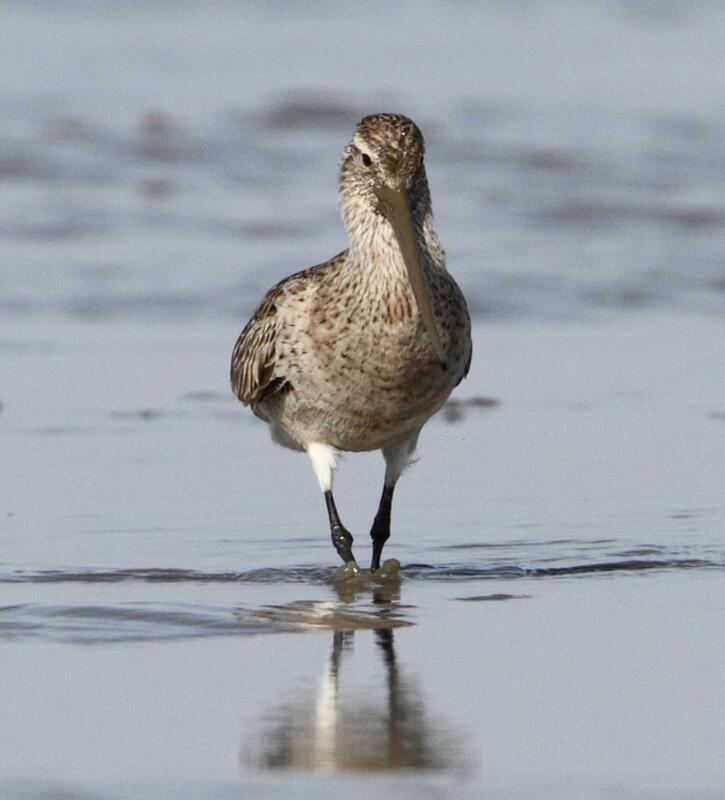 Crossing the ultimate ecological barrier: evidence for an 11,000 km-long nonstop flight from Alaska to New Zealand and Eastern Australia by bar-tailed godwits. Condor 107: 1-20. McCaffery, B.; Gill, R.E. Jr. 2001. 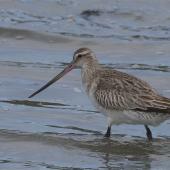 Bar-tailed godwit (Limosa lapponica). 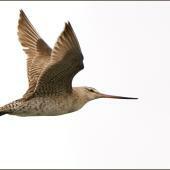 In Birds of North America, No 581 (A. Poole and F. Gill, eds.) Cornell. Woodley, K. 2009. 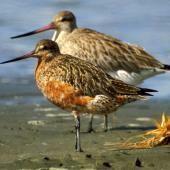 Godwits: long-haul champions. Raupo/Penguin, Auckland. 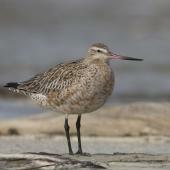 A large long-legged wader, brown above, pale below, with a long tapering and slightly upturned pink bill with black tip. 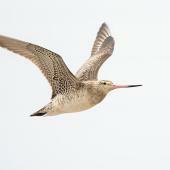 Males are markedly smaller with shorter bills than females.